Last year, Yangphel organized its biggest national archery tournament ever: 900 archers from all over Bhutan made150 teams and played a total of 180 matches over almost two months. 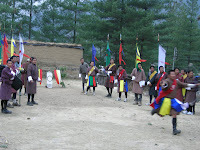 The tournament commemorated a hundred years of monarchy and celebrated the coronation of our fifth Druk Gyalpo. Yesterday, Yangphel organized its annual internal archery tournament: 30 archers, all Yangphel employees, made six teams and played a total of five matches over two days. The final was played today. And, in true Yangphel style, prizes included television sets and cash. But to me, everyone – proprietor, management and employees – was a winner. After all, the last two days was a celebration of the excellent relations between workers and management of a successful company … a GNH-company.